Wondering what to do in Amsterdam in January, February or March? Winters in Amsterdam are considered mild. Temperatures can drop, but the city is near the sea, so temperatures in winter don’t go that far below zero. Icy winds and a humid air can make a winter in Amsterdam feel much colder however. A day of walking around the Amsterdam canals get you very, very chilled. On a holiday to Amsterdam in winter, it’s important to find activities in Amsterdam that can warm you. Dutch food is known mostly for it nutritious quality. No culinary art, but simple food, rich in calories for the necessary energy that will give your body that little bit of extra to help you handle the humid and cold air sweeping through the streets and your bones. It’s in winter time, that Dutch food shows its value: lots of potatoes, fatty meats and local vegetables with high levels of vitamin C and iron. Many typical Dutch vegetables are actually harvested in winter time, such as ‘winter carrots’, zuurkool (sauerkraut) and boerenkool (kale, a cabbage like plant). Most common Dutch winter dishes are soups, like Dutch peasoup (erwtensoep) and stamppot. Stamppot consists of boiled potatoes mashed with vegetables and sausage. Most famous are hutspot (potatoes, carrots and onion) and boerenkool stamppot (potatoes and kale). These dishes are typically home cooked and not served in restaurants. The quality depends on the freshness and quality of the used vegetables. Some tourist restaurants in the centre serve ‘Dutch food’ including stamppot, but if it tastes much like a home cooked Dutch meal is doubtful. Be sure to grab some Dutch pea soup in winter in Amsterdam. It’s easy to find and definitely recommended. 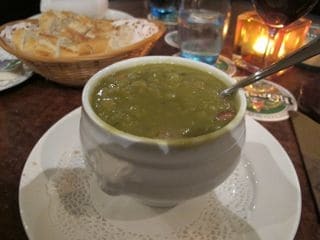 You can find pea soup in winter and in autumn in Amsterdam in restaurants and smaller eateries in Amsterdam. Look for signs that say: erwtensoep or snert. Dutch pea soup is delicious and wonderfully filling. 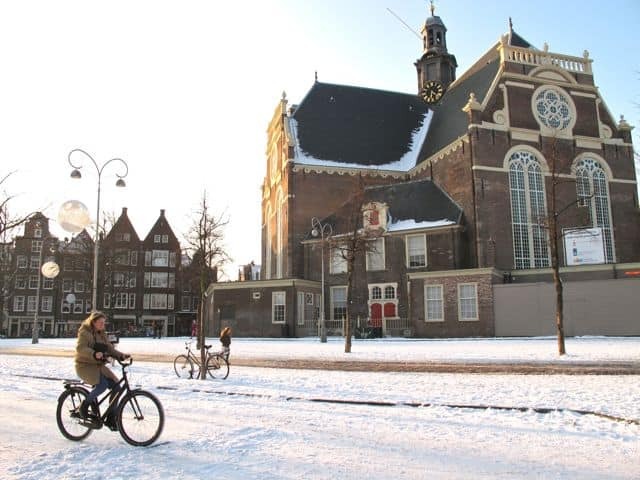 Snow at Noorderkerk in de Amsterdam Jordaan District. 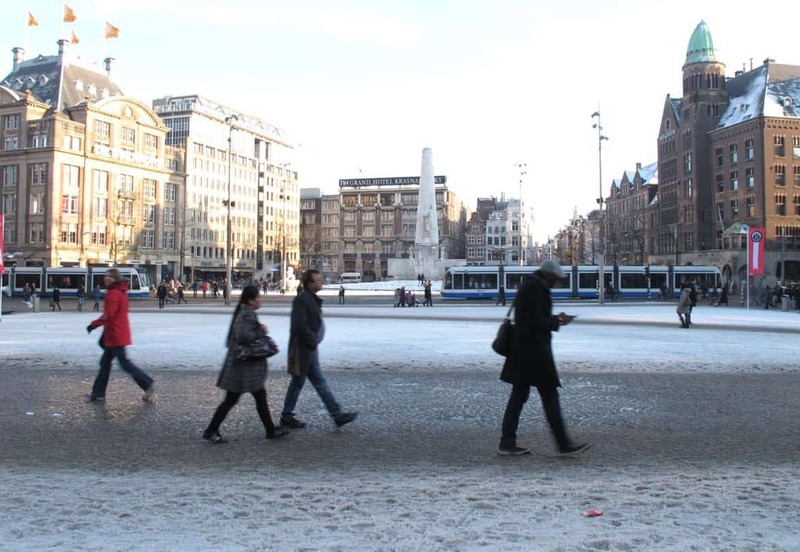 When the city of Amsterdam is covered in a blanket of snow, it’s difficult and chilly to walk around. And when the temperatures start falling below zero, riding a bicycle can be very dangerous. Every year, many people end up in hospital after biking accidents due to slippery road. So why no try out the Amsterdam public transport? The Amsterdam trams are a good start: they give you access to areas of Amsterdam tourists don’t usually frequent but are certainly worthwhile. Just pick a seat near the heating and watch ‘normal Dutch’ people get in and out the tram in their normal daily live. Don’t forget to watch the scenery outside. The Amsterdam East is a beautiful area, with broad streets, lots of trees, water and characteristic buildings. Take tram 3,7,9, or 14. You can either just stay put in the tram and and take the same tram back again or get out and wander around the area you’re in. Snowed canals in winter in Amsterdam. Amsterdam Museums are warm places where you can hide away from the cold outside. Unfortunately, the best museums in Amsterdam are popular, which means standing in line in the cold! Remember always to buy a ticket to the most famous museums in Amsterdam online, so you can skip the line. Check out the Amsterdam Exhibitions Calendar to see what temporary exhibitions the museums in Amsterdam are showing. If you are planning to see museums in Amsterdam, an Amsterdam City Pass might be a good idea. There are 4 types of cards that make entrances to the museums and other attractions easier and you save a little money. I made a comparison of the various Amsterdam passes for you to make it a little easier to choose. A canal cruise in Amsterdam might seem a bit lame, but when you see the low canal cruisers go by, it’s a lot of fun. In winter in Amsterdam, it’s best not to wander around outside too long. Because of the wind, winter in Amsterdam can make the temperature can feel colder and make your body temperature go down quickly. On a canal cruise you can see the best of Amsterdam – 17th century canals and the Amsterdam canal houses from a dry, warm place. Really need to warm after walking all those canals? Great thing to do in winter is visit an Amsterdam sauna. A well known sauna is Sauna Deco, centrally located in the Amsterdam canal belt area at Herengracht 115. It’s small and there is no swimming pool, but the it’s beautifully decorated in Jugendstil. The most luxurious Amsterdam spa is the one from the Conservatorium Hotel at Museum Square. The Conservatorium Hotel is one of Amsterdam finest, stylish and most expensive hotels. And their Akasha Holistic Wellbeing spa fits perfectly. It has an indoor swimming pool, jacuzzi, sauna, steam room, relaxation areas, a gym and of course many treatments. In the parkland woods of Amsterdamse Bos lies a popular Spa: Spa Amsterdam Zuiver. Here you will find wide variety of pools, hot tubs, saunas, hamams and lounge areas inside and outside. To get to Spa Amsterdam Zuiver, take bus 170 or 172 and get out at Koenenkade. You can combine the visit to the Spa with a nice long walk in the beautiful park of Amsterdamse Bos beforehand. Or just stay in bed in winter in Amsterdam and enjoy the Amsterdam night life. The Amsterdam night life is only to be explored during the weekend. Combine a visit to a restaurant with a night of Amsterdam clubbing. Great take on winter in Amsterdam! At Bucket Buddies are initial audience will be expats in Amsterdam, and this is a good honest look at what that entails…some chilly winter days, and beautiful buildings! The soup idea is a great one! Haven’t had the pea soup yet so I suppose I should get on that! I’m going to share this on our Twitter (@Bucket_Buddies), thanks for the post!